Habitat: Desert, Upland. It grows in sunny, open areas. Description: The flowers are clustered in umbel-like heads at the tops of tall, leafless flower stalks. 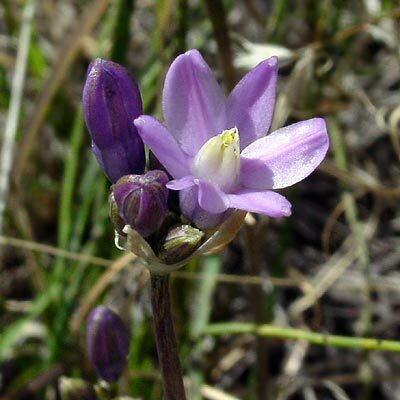 The individual flowers are 1 inch (2.5 cm) wide and have 6 petal-like segments. The leaves are green, narrowly linear, and grasslike. The crushed leaves smell like onions. The plants reproduce both by their swollen, onion-like, underground corms (bulbs) and by seed. 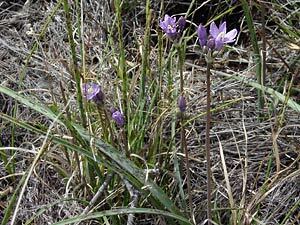 Culturally Significant Plant – Native Americans traditionally gathered the corms for food. Edible – The starchy corms are edible, but the plants are protected (see below), so do not eat them. Legal Status – The subspecies D. capitatum ssp. pauciflorum is a Protected Native Plant (Salvage Restricted).